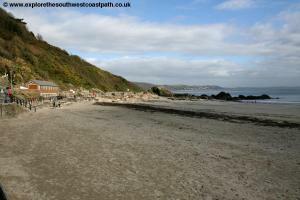 This walk starts from the popular resort town and fishing port of Looe situated at the mouth of the river and split into East and West Looe. From here we head east along roads and tracks to Millendreath. Beyond Millendreath the walk is mostly rural with fine views. The walk passes through the villages of Seaton and Downderry where road walking is needed at high tide before we return to good quality cliff top paths for the rest of the way to Portwrinkle. Looe is easily reached. By road, from the A38 trunk road exit onto the A374 and after a mile or so turn right onto the A387. 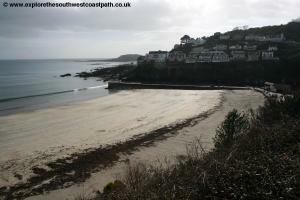 You then follow this road all the way into Looe. Parking near the centre of Looe is limited. As you approach the centre of the town there is a car park on the right just before the bridge and another smaller one just south of the bridge. If these are full there is a large car park in West Looe, just north of the bridge which should have plenty of space. If you are coming by public transport Looe has a railway station on the unusual and scenic Looe Valley Line which is a branch run from Liskeard on the main line. Trains run a little less than hourly Monday – Saturday and take around half an hour from Liskeard, depending on the number of stops. Trains also run a similar frequency on Summer Sundays. All trains on this line are operated by Great Western Railway. At Liskeard there are connections with Plymouth, Totnes, Newton Abbot and Exeter to the east and St Austell, Truro, Redruth, Camborne and Penzance to the west. Trains on the main line at Liskeard are operated by Great Western Railway and Cross Country Trains. As well as trains Looe has a regular bus service. Western Greyhound service 572 runs hourly Monday – Saturday from Plymouth to Polperro via Looe, St Germans and Saltash. This runs from Plymouth bus station and also serves Plymouth, St Germans and Looe railway stations for rail connection. There is no service on this route on Sundays. Cross Country Trains service 573 also runs hourly Monday – Saturday from Polperro to Liskeard and Callington via Looe. This bus serves the railway stations at Looe, Sandplace and Liskeard. On Sundays route 573 once every two hours between Polperro and Liskeard only. Due to the limited public transport to Portwrinkle you may prefer to park there and travel to Looe to begin the walk so you can walk back to your car without worrying about missing the bus. A Line Coaches service 80B runs 4 times a day Monday – Saturday only from Portwrinkle to Liskeard. You can catch this bus to Liskeard and then travel from Liskeard on to Looe either by bus 573 or by train (the bus stops at both the town centre and railway stations). 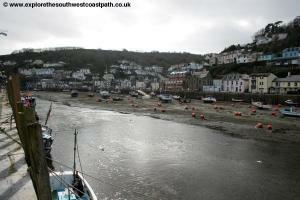 Looe has a good range of accommodation. 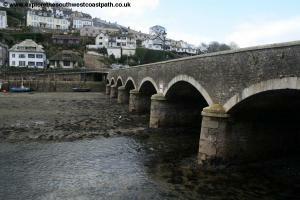 The Old Bridge House Hotel is a small hotel on the river in Looe. The Portbyhan Hotel is a hotel in West Looe. Polrean Country House Hotel is located in Sandplace just outside Looe and Sandplace railway station is close by which offers trains to Looe. 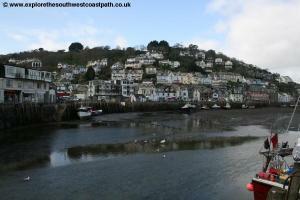 The River Croft Hotel and Apartments is also located in Looe. 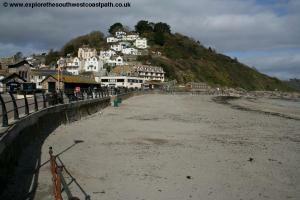 Looe Directory provides a directory of hotels, guest houses, bed and breakfasts and campsites in the area. However you arrive at Looe make sure you are in East Looe (the side of the river where the railway station and main town are) and head south either through the town or alongside the river until you reach the beach. 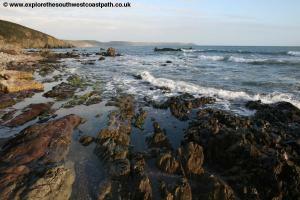 This is a good sandy beach with rocks at either end although it often has quite a lot of sea weed on it. 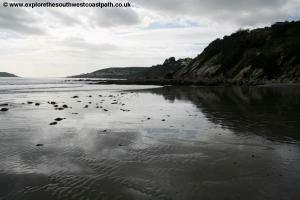 The coast path begins from beach here. Turn left, with the sea on your right and take the zig-zag path up from the beach to reach a wide track which you turn right along. This soon narrows to a path. 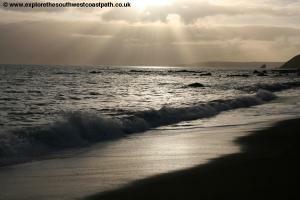 When the path splits keep the most coastal of the routes, which is well signed. 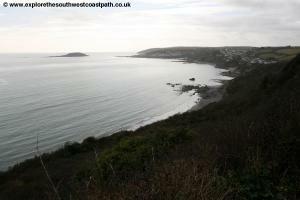 This is a pleasant cliff top walk with fine views out to sea over Looe and Looe Island nearby. Soon you pass a few houses on the left and just past these there is a path down to the right down the beach which is a mixture of rocky and sand. The coast path doesnâ€™t take this path but continues straight ahead along side houses until it reaches the minor road in the village of Plaidy. Here turn right and follow this minor road past the houses of the village. 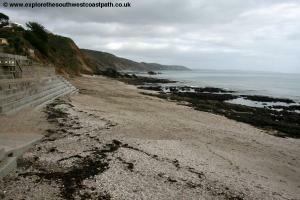 This soon brings you to Plaidy beach where there is a slipway down to the beach. However this is not the route of the coast path, instead here you continue along the road behind the houses on the right. The road then turns to the left away from the coast and after the house on the right you fork right on the signed coast path to emerge into another residential road. Follow this past half a dozen or so houses and then the road turns sharply left. Just past this point you turn right on the signed coastal path to follow a gap between the houses and descend down to the beach at Millendreath. This is an unusual village largely dominated by a holiday camp which goes up either side of the valley which at the time of writing is run down and partly derelict. There are plans to re-develop this into more modern holiday accommodation so hopefully soon it will improve. In the meantime this is still a lovely beach. Round the road at the back of the beach and continue ahead (the road is signed as a dead-end, but the footpath continues from the end). As you approach Bay View Farm the path returns to being a road again and you continue straight ahead. Just opposite the farm, turn right on the signed footpath to emerge at a lovely viewpoint and picnic site, offering fine views over Looe Island. Keep to the path at the right here, the most coastal route and follow the good path along the cliff top. 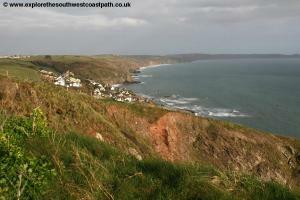 The coast path is then a gently undulating path along the cliff top for around half a mile. Ahead the path then enters woodland close to the cliff top. You very soon emerge from the woodland above Keveral Beach. Soon you pass a permissive path off to the left which leads up to the road but you continue along the coast path heading east. 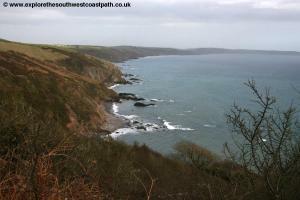 Around 500 metres beyond here the path then turns to the left, away from the coast and with woodland on your right to come down to the minor road at Looe Hill. On reaching the road, turn right and follow it down hill to come down into the small village of Seaton (not the only place of this name on the coast path!). Keep to this minor road until it reaches the main road which you turn right along to cross the River Seaton and continue along the back of the beach. 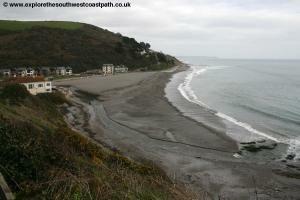 Seaton beach is a mixture of sand and shingle and a popular place in the summer. East of Seaton you have a choice. 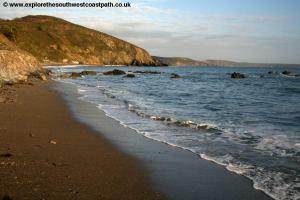 The official route of the coast path is to continue east along Brenton Road, the main B-road through Downderry. If you follow this route, keep along the main road all the way through Downderry, which is roughly 1 miles along the road in total. When the houses end and the road turns sharply up a hairpin bend to the left, you go straight on from this corner along the coast path on the footpath just to the right of the entrance to Downderry Lodge. This route is not ideal however because the road lacks a pavement for most of it's length and can be quite busy. 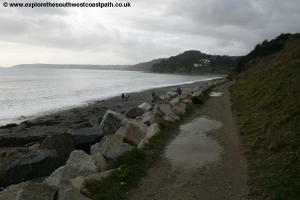 There is an alternative, which is to follow the sea wall from Seaton due east. You should be aware, as the numerous warning signs state, that the sea wall is in a state of dis-repair and so after a while you have to go down onto the beach. 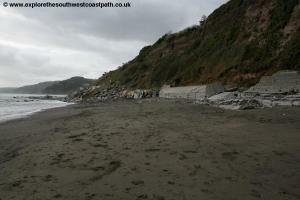 This is sometimes covered at high tide so if the sea is reaching the cliff you will have to turn back. If you do follow this route, the sea wall is initially good, but soon becomes broken up and you will then need to walk along the beach. Just after the point where boats are usually left at the back of the beach, join the road, Beach Road and follow it up to the main road (called Main Road) where you turn right to re-join the official route of the coast path. Keep to this road to the houses end and there is a hairpin bend to the left. Here you turn off to the right on the signed coast path just to the right of the house Downderry Lodge. The path now zig-zags up to the cliff top and on reaching the cliff top turn right with the path. 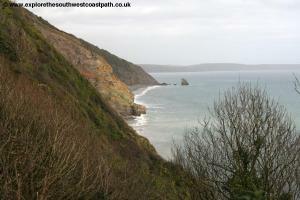 What follows now is a very fine bit of coastal walking along the high and undulating cliffs. 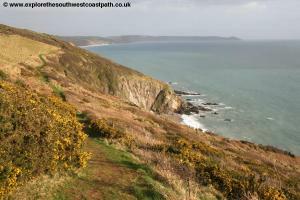 The path soon opens out onto the gorse covered cliffs and you follow this to a point known as St Germans Hut. 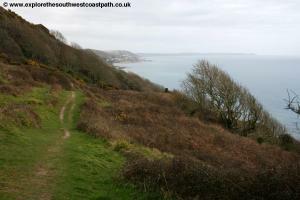 Here there is a steep path down to the right through the trees and gorse to the beach, but it is a rough path and a long way down and back up, so not recommended (you will have to return by the same route to get back to the coast path). Instead continue to Cargloth Cliffs and keep with the coast path as it turns a little to the left, still along the cliff top. The path goes round a couple of field edges here and soon returns to the gorse-covered cliffs. 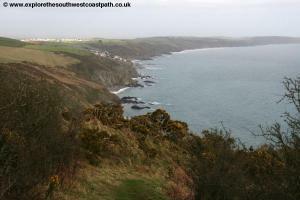 Soon you reach Britain Point and follow the coast path out onto this little headland. Just beyond this you descend into Portwrinkle where you reach a minor road. Turn right here, continuing down hill to the road above the beach and small harbour. Follow this road along the back of the beach to the main car park. There is a cafe at the far end of the car park and a path down to the beach here, which is a mixture of sand, rocks and shingle. The buses go from the bus stop by the car park at the top of the road here. A walk of around half a mile along the road will bring you to Crafthole which has more facilities including a pub and post office and a slightly better bus service. From Portwrinkle A Line Coaches service 80B runs 4 times a day Monday – Saturday only from Portwrinkle to Liskeard. From Liskeard Western Greyhound service 573 runs hourly back to Looe. Service 80B also serves Liskeard railway station from where there are trains to Looe operated by Great Western Railway. At the time of writing (June 2013) the last bus from Portwrinkle is at 18:27 and has a connection onwards by train only. This arrives at Liskeard Railway station at 19:03 and the last train from Liskeard to Looe is at 19:18 arriving at 19:49. Ordnance Survey Explorer Maps 107 and 108 cover this part of the coast of Cornwall and are widely available locally and in major book stores nation wide. The following links also show the map of this part of the coast.